There’s a new student in the classroom, but this is no ordinary kid. He’s actually a book-eating zombie that begins to devour every book he can find. When the class heads to the library, the students know his only goal will be to eat every book there. Acting quickly, one boy saves the day. And when another monster arrives, wreaking havoc on the library, the zombie steps in to help out, also. 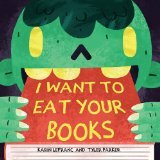 I Want to Eat Your Books is told in rhyming verse with vibrant, kid-friendly illustrations. Children will giggle as the zombie gobbles books, and they’ll smile at the easy friendship between the two monsters. This book will be huge hit at Halloween. I highly recommend it.